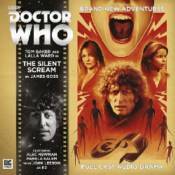 This range of two-part audio dramas stars Tom Baker reprising his most popular role as the Fourth Doctor (from 1974 - 1981) with a number of his original TV companions. This fifth series reunites the Doctor with Romana (Lalla Ward), a fellow Time Lord for adventures across Time and Space! On the set of a busy Hollywood movie in the late 1920s, a damsel is in distress! As cameras roll, she opens her mouth to scream and...nothing comes out. Nothing at all. It's happened again.The Doctor, Romana and K9 have arrived in a terrified Tinseltown. A new film is being made and several stars of the silent screen are viewing it as a potential comeback...but it may prove a poisoned chalice. Actors are vanishing and strange creatures stalk the streets.Something evil is lurking behind the scenery. Can the Doctor stop it when he doesn't have a voice? It's time for his close-up. The sixth series in a Big Finish range which is hugely popular with fans young and old of the classic TV series Doctor Who. This pairing of the Doctor and companion Romana harks back to the most-watched period of Doctor Who, one that to a generation is the most loved and iconic and which broke the records for viewers of the show. Tom Baker's portrayal of the Fourth Doctor Who still tops popularity polls today. He was a special guest in 2013's 50th anniversary story Doctor Who -The Day of the Doctorand in 2016 was the subject of an extensive interview special read by the thousands of Doctor Who Magazine readers. Author James Goss has recently worked on behalf of the Douglas Adams Estate, novelising two of the famed writer's Doctor Whoscripts for the first time.CAST: Tom Baker (The Doctor), Lalla Ward (Romana), John Leeson (K9), Alec Newman (Dr Julius), Pamela Salem (Lorretta Waldorf).